We had a bake sale at work to raise additional money (on top of our personal pledges) for one of the federations we support through our yearly Community Fund Drive: Open Your Heart to the Hungry and Homeless (www.oyh.org). 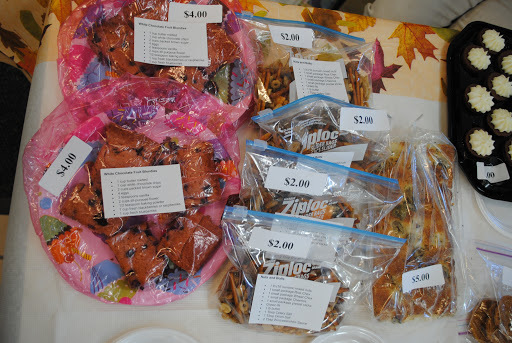 The bake sale was combined with a silent auction. 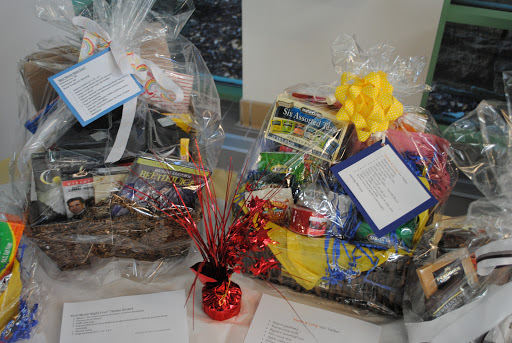 I mentioned in my previous post that my work team was putting together a movie theme basket for this silent auction. 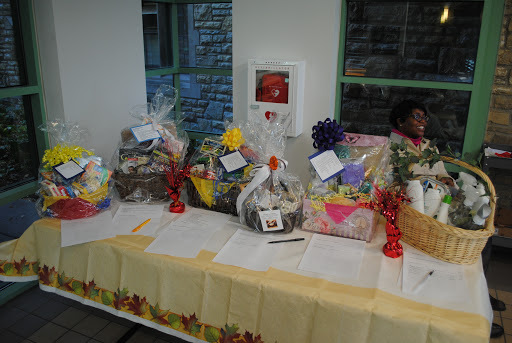 Following are photos of just some of the wonderful baskets our department’s units came up with for this auction. Ours is the one on the left is the first photo below. In addition to bagging up the Nuts and Bolts I made for the bake sale, I tried a new recipe, as well. This one was not from my mom’s and grandma’s recipe file. 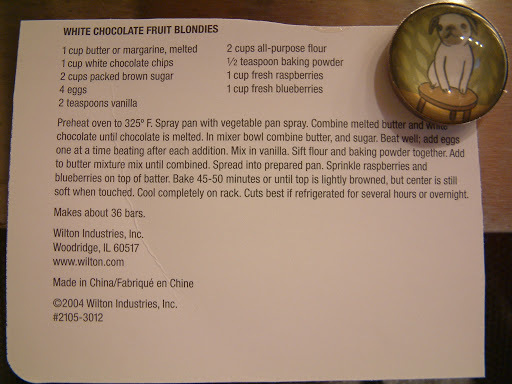 I found this new recipe on the back of the label that was affixed to the new cake pan I bought. My cake pans were looking pretty rough—not just scratched up, but in some cases even getting a rusty appearance in places. So, while shopping at Byerly’s, one of the grocery stores I frequent, I purchased a very heavy-duty Wilton cake pan. It was on the back of the label for the cake pan that I found this recipe. I thought it sounded yummy and had to try it. Preheat oven to 325 degrees. Spray pan with vegetable pan spray. Combine melted butter and white chocolate until chocolate is melted. In mixer bowl combine butter and sugar. Beat well; add eggs one at a time beating after each addition. Mix in vanilla. Sift flour and baking powder together. Add to butter mixture mix until combined. Spread into prepared pan. 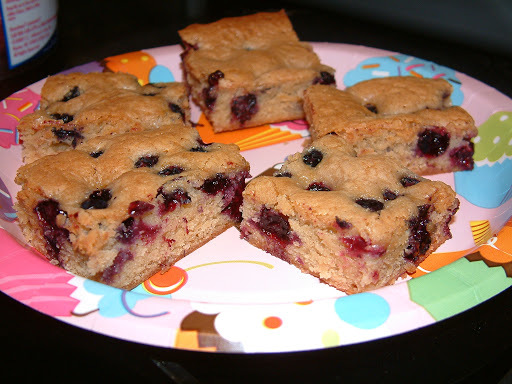 Sprinkle blackberries or raspberries and blueberries on top of batter. Bake 45-50 minutes or until top is lightly browned, but center is still soft when touched. Cool completely on rack. 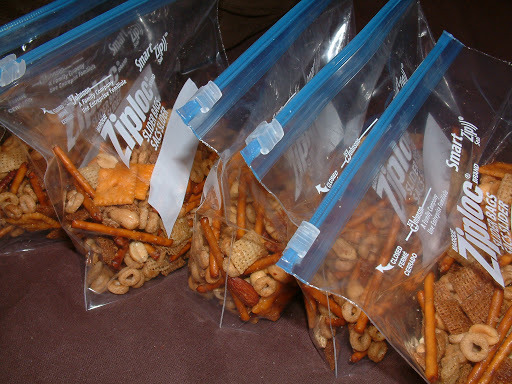 Cuts best if refrigerated for several hours or overnight. Makes about 36 bars. They were out of raspberries at Super Target, so I substituted blackberries instead. 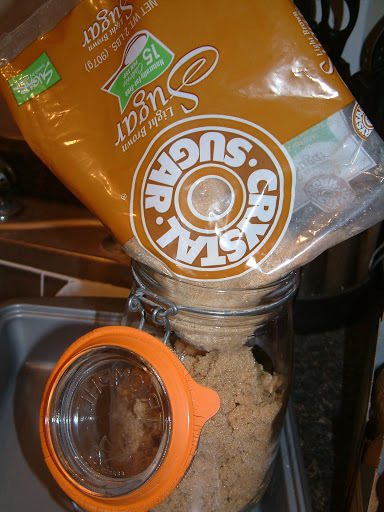 I was especially intrigued that the recipe called for brown sugar only. I love brown sugar. Something about it is just so much more sensual than white sugar, don’t you think? This item was tasty, if I do say so myself, and it was a big hit at the bake sale. It was one of the earliest items to sell out! This entry was posted in bake sale, desserts and tagged bake sale, berries, desserts, white chocolate. Bookmark the permalink.